I've talked about some of the many bugs that came with the Ossus patch, but one I haven't mentioned before concerned Kil'Cik, the Geonosian world boss. A bug with the bug, so to speak. 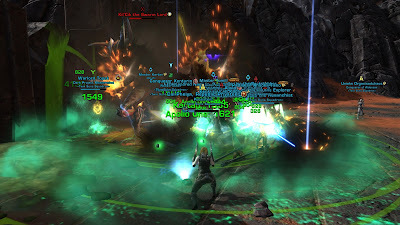 Separate from the issue mentioned in the post I linked above, which caused individuals to sometimes not get quest credit for killing either of the world bosses (which was quickly patched out), this particular problem affected only Kil'Cik, but whenever it struck, nobody in the group would get credit for the kill. The good thing about this was that at least it gave the whole group an incentive to immediately try again in another instance. The bad thing was that somehow this particular bug got people's imaginations going. Nobody could possibly know what exactly was causing it, but humans love to look for patterns, and a certain type of people with endless confidence in themselves didn't hesitate to quickly start passing off their personal observations as fact. First they claimed that the boss supposedly bugged if you didn't tank him in the middle of his platform, which was eventually amended to him at least having to die there. I immediately knew that was rubbish because during my very first kill the boss had spent pretty much the entire fight up against the wall and we'd got credit for the mission just fine. Eventually enough people seemed to observe the boss bugging out despite of being tanked in the middle of the platform that at some point an alternative theory emerged. It wasn't the boss's position per se, they said, but people registering as too far away from him, which most commonly happened if someone disconnected or died and then returned to the med centre. So any disconnected people were swiftly removed from the group from then on, and someone usually issued a decree just before the pull that people should under no circumstances return to med centre if they died. When that still didn't solve the issue, it somehow became about death and reviving in general, so now combat revives were banned as well. As time went on, people got more and more passionate about their convictions about what supposedly caused the boss to bug. I saw one guy get removed from the group when he dared to return to the med centre after dying, and generally people got quite shouty. I had to chuckle last night when someone drily commented in response to one such authoritarian that "maybe the boss bugs out every time someone types in all caps". Today I finally found out the solution to the mystery. Bioware recently added a new official account to the forums called "QA_Droid", which gets used by various devs to communicate with the players about bugs and other technical issues. In a recent post they revealed the true reason behind the boss bugging out: whenever a guardian add is killed, it shaves off a percentage of the boss's health, and if you kill one at just the wrong moment so that this damage becomes the killing blow, kill credit is given to the dead mob instead of the raid group. What do you know. It really tickles me that in the end, all those wild theories weren't even remotely close to what was really going on. I'm in no position to make fun of people though, because I didn't know any better either. Sure, I knew that the "must tank him in the middle" theory was rubbish from the beginning, but the one blaming respawning/player distance for the bug sounded plausible to me and at least personally I didn't experience any fights that provided conclusive evidence to the contrary. Either way it's interesting to see how quickly superstitions like that can develop and get passed on simply because of some people very confidently stating them over and over again.